SIIG's USB Desktop Keyboard is a full size, standard, entry level keyboard. This keyboard is designed with long life soft membrane key switches to provide comfort and silent typing and water-resistant keypad to prevent short circuit due to liquid spills. It also features 103-key QWERTY keyboard layout, numeric keypad, and USB plug and play compatibility - simply plug the keyboard into any USB port and the drivers install automatically. 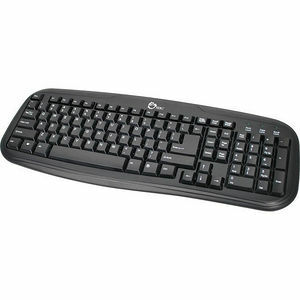 The USB Desktop Keyboard is FCC and CE approved and RoHS compliant. In addition, it is compatible with a wide variety of Windows operating systems and is backed by SIIG's limited 2-year warranty.